I want to give a big and hearty CONGRATULATIONS to Vera, the winner of the Sibu Beauty Skin Care Package! Vera now has 48 hours to confirm! I also want to give a big and hearty CONGRATULATIONS to Sandy, the winner of the six-pack of 5-Hour Energy shots! Sandy now has 48 hours to confirm! I also want to give a big and hearty CONGRATULATIONS to Carol, the winner of the Sound+Sleep nomad Adaptive Sleep Therapy System! Carol now has 48 hours to confirm! I also want to give a big and hearty CONGRATULATIONS to Danny, the winner of the $50 IHOP Gift Card from Out to Eat with Kids! Danny now has 48 hours to confirm! 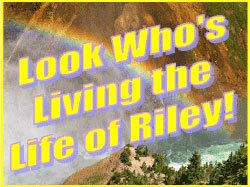 *** WINNERS *** Karen, Lisa, Robyn and Tina are Living the Life of Riley! CONGRATULATIONS!